Authorities of Jinjialing Financial District, the core area of Qingdao's financial industry, said they would work on the further development of wealth management, financial technology and financial safety in the next three years. This is part of the city's plan to develop a modern financial service industry as a new growth engine for the regional economy. The move aims to transform the local economic growth engine from traditional manufacturing to financial services, according to the local government. By 2020, the financial industry is expected to contribute 25 percent of the district's gross domestic product with an annual growth rate of 20 percent. The sector's gross profit is projected to reach 17.5 billion yuan ($2.77 billion) by then, according to a three-year development plan for Jinjialing. Back in 2014, Qingdao was approved by the central government to establish the Qingdao Wealth Management Financial Comprehensive Reform Pilot Zone, laying a solid foundation to realize the goal. The Jinjialing Financial District, as the core of the pilot zone, has plans to introduce more financial institutes with strength in wealth management, expand market scales and build industrial chains, on its way to becoming a provincial wealth management hub. The district is planned to promote the commercialization of scientific research results related to fintech, or financial technology, to facilitate the transformation of traditional industries and better serve the real economy. All operations will be based on a reliable, safe, self-disciplined and fair environment, to avoid regional financial risk, said local officials. Jinjialing is located in Qingdao's Laoshan district which boasts a landscape of mountains and beaches. The authorities said there are plans to build a livable, modern coastal area there by making the most of the ecological resources. The residents' need for a better life was addressed in Jinjialing's development plan. The financial district is also designed to become an example of future urban living and a destination for visitors to experience the charm of Qingdao, through an innovative management system, city regulation and urban design. Since the focus of the country's economy has transformed from rapid growth to high-quality development, Jinjialing financial district will also strengthen quality control in guiding the development of its financial services industry, according to local officials. 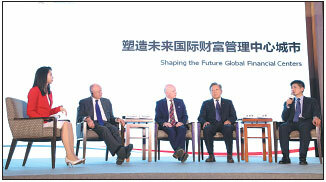 They said the financial district will strive to explore an innovative mode that can be learned by other regions of China.